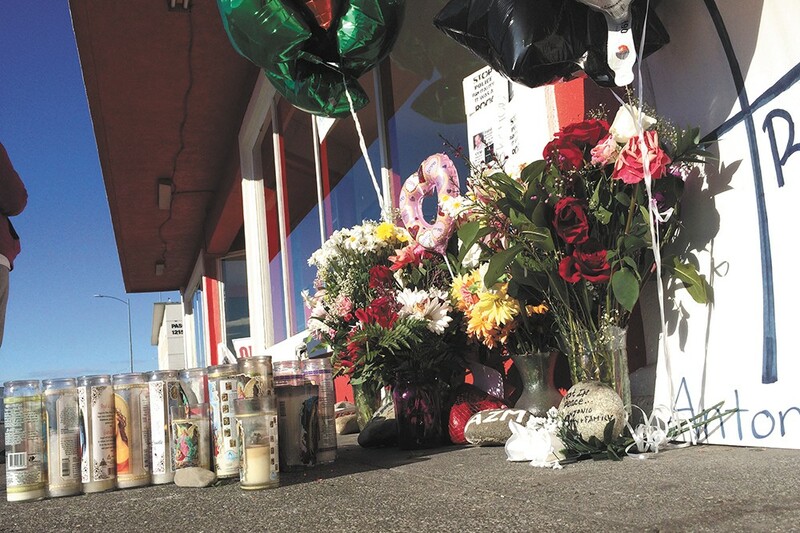 A memorial for Antonio Zambrano-Montes has become a community gathering place in Pasco. It was just a rock. That's the rallying cry — and phrase seen on numerous protest signs — in Pasco, Washington, since Feb. 10. The now-famous video that shows Antonio Zambrano-Montes tossing a rock has been seen millions of times since it first gained online traction soon after his death. In the video, Zambrano-Montes is confronted by three police officers, who had been called to the Fiesta Foods parking lot in response to a man throwing rocks at passing cars. Three officers give chase across the busy 10th Street and Lewis Avenue intersection, filled with 5 pm traffic. As the man reaches the window in front of Vinny's Bakery and Cafe, he turns around toward the officers. They shoot. He falls to the ground. Dead. The scene, with its racial and police response overtones, had all the makings of a national and international news story, which is precisely what it's become. Overnight, the Latino community in this south-central Washington city would begin to rally. As word spread, and the video views racked up online and on TV news, the New York Times would feature it on its front page. Rallies, protests and marches would continue for at least two weeks. Pasco, population 68,000, was about to become Ferguson for Latinos. The final moments of Antonio Zambrano-Montes' life, captured on video. Eleven days later, on a relatively warm but still crisp and windy Saturday morning, Martha Zambrano is tidying up candles and flowers around a sidewalk-side memorial at the spot where Antonio Zambrano-Montes died. She arranges the candles into an orderly cross and places new flowers around them. She grabs a broom and sweeps away bits of debris that have blown into the makeshift memorial. It's a task she's been doing since the memorial sprung up after her nephew was killed. The site has become a memorial to a man, father, son and nephew. He had been in the U.S. illegally for at least 10 years working, as many thousands do, as an immigrant farm laborer. Zambrano-Montes' time in the U.S. was complicated and contradictory and, as the video shows, cut short by a widely seen interaction with police. Family and friends describe a funny, smiling man, one who loved and lived for his daughters. But he was separated from those daughters after his wife divorced him and moved to California, having obtained a protective order after claims he had abused her. He pleaded guilty to assaulting a police officer in a January 2014 incident, according to reports. With his family gone, and after a house fire burned many of his worldly possessions, it seemed to those who knew him that he was spiraling into a deep sadness. "All the time I think about it," Martha Zambrano says of her nephew. "My heart aches." Then she adds, "The police do these things here." It didn't take long before the comparisons between Pasco and another high-profile police-shooting incident began rolling in, with the New York Times dubbing it a "'Ferguson' moment for Hispanics." As Joey Johnson, who came from Oakland, California, to join a Feb. 21 protest, put it, "Pasco now has the extreme dishonor of being in the same category as Ferguson." That comparison to Ferguson — with its fallout from the death of black teenager Michael Brown after being shot by a white police officer who was not indicted — was seemingly inevitable. Similar to Ferguson, Pasco's racial dynamics and demographics of the power structure are imbalanced. Though the city is majority Latino, only 14 of its 68 police officers are. One of the seven city councilmembers, which includes the mayor, is Latino. That imbalance between population and power centers is what protest organizers are highlighting — along with their chant of "Out of your houses, into the streets, justice for Antonio." Picking up on the "Black Lives Matter" chant heard often in the past year, protesters in Pasco chanted, "Latino lives matter. Black lives matter. Immigrant lives matter. All lives matter," during the Feb. 21 rally and march. Before this time, national attention on immigration tended to center on policy debates in the "other" Washington or disputes between border states and the federal government. The reaction to Zambrano-Montes' death has focused the attention farther north, where Latino immigrants often head once crossing that border. This corner, this little slice of sidewalk steps outside of Vinny's Bakery now adorned with candles and flowers, is what one participant at the Feb. 21 rally called "probably the most Latino spot in all the Northwest." Whether it's "the most Latino spot" is subjective, but there's no doubt this section of east Pasco — where authentic taco trucks and Hispanic grocery stores are the norm — is deeply tied to the immigrant identity that makes up this part of Washington state. Seattle and Spokane may dominate the west-versus-east debate in the Evergreen State, but there is an important central section often overlooked. Central Washington is an agricultural titan in many ways, which brings with it the reality of immigration and migrant farm work that initially attracted and now requires a steady Hispanic labor force. Pasco, with its 56 percent Latino population, and its sister municipalities of Richland and Kennewick that make up the Tri-Cities, sit at what could be considered the crossroads of agriculture, political and immigration forces, flowing downstream through central Washington. From north to south, beginning at the Canadian border, follow the Okanogan River through Oroville and Omak, until its confluence with the Columbia River at Brewster, picking up the city of Wenatchee. These rivers cut through central Washington and sustain the tree fruit economy that makes Washington a leader in apple, pear and cherry production. At the same time, near the top of Snoqualmie Pass, the Yakima River cuts east and south, through the Yakima Valley, past Selah and Sunnyside, finally joining the Columbia River at the Tri-Cities. All those waters feed the agricultural identity of central Washington. Along the way in most towns and cities, immigrant farm workers make it all possible. Their work has helped make the Tri-Cities the third largest metropolitan area in Washington. Zambrano-Montes was a part of that immigrant farmworker identity in the Tri-Cities. His death has sparked not just calls for police reform and better training, but demands for better communication with, and representation of, Latino immigrants in this area. Since the shooting, demonstrators have set up in front of Pasco City Hall, about a mile from where it happened. Eddie Enriquez has been here at city hall most of that time. He's lived in Pasco 34 years, raised a family and owns a business. He and others demonstrating are conveying a message that no matter a person's legal status, everyone needs and deserves the same protections and equality under the law. "This community is built on a lot of immigrants who are afraid to speak up," Enriquez says. "We're a proud community. We stand behind each other." He says that he and his fellow demonstrators are not against the police, noting that they keep the order and protect civilians. "They just need to go by their own handbook," he says. "Nobody is above the law." Though much of the Pasco and Tri-Cities area is united in showing support, that support manifests itself in different ways for different people and groups. As Enriquez and his fellow demonstrators held vigil at City Hall last Saturday, and before the official afternoon rally and march, the makeshift memorial outside Vinny's Bakery received another influx of visitors. There were no megaphones or protest signs demanding "Justice for Antonio" held here. Rather, they held hands and prayed. For an hour on Saturday morning, just after Martha Zambrano had done her daily sweeping, members of Pasco's New Hope Missionary Baptist Church prayed and sang gospel hymns in front of the candles. Cars drove past, honking their support, but not throwing off the rhythm of the mostly black group. "Hallelujah, Jesus, worship your name," they sing. "Our God can heal. He can deliver." As they sing, cars continue through the busy intersection, some honking, some slowing to take in the sight and sound of the choir. A few residents stop by the memorial and take pictures, often posing in front. They pause and seem to bow their heads in reflection and possible prayer. Another driver turns the corner onto Lewis Avenue, seeing the group for the first time. She honks, slows and makes the sign of the cross. The choir finishes another song. "I like that one," says choir director Elouise Sparks, repeating some of the lyrics. "God reigns over the circumstances. Yes he does. God reigns." Afterward, Sparks points out that most of the people in this largely black church grew up in the area. They purposely came here to pray and sing, not to take part in a formal protest, saying they don't want to take sides or be political. "We want to spread hope amidst the turmoil," she says. Church member James Brown, who moved to Pasco from California, reiterates that. "For us, it's not about police brutality," Brown says. "We're here for spiritual support." Later that afternoon, people would gather at the same spot, not to sing or pray, but to voice their grievances and chant for justice and police reform. It would be the second Saturday of protest and marching since the shooting. Members of the local Latino community speak into a megaphone, interspersed with activists from Portland, Seattle, Oakland and Spokane. All had a similar message with variations on a theme: End police brutality. Question the investigation taking place that's led by the Kennewick police across the river. Demand more civilian oversight of police. At the stoplight, cars line up as more protesters gather. They're stopped at the same light, in the same position, as the person who recorded the now-famous video. A bevy of horns begins to blare as the cars wait and the protesting crowd chants louder. One, two, three, four, five drivers honking their horns. "Immigrant lives matter! All lives matter!" the crowd chants. After some time passing the megaphone, the crowd marches away from the candles and flowers outside Vinny's toward City Hall and police headquarters. Along the way, they chant more and implore people to join the march, as some do. Traffic slows, more people honk, not in anger over the inconvenience, but in agreement with the message. Unlike in Ferguson, where for some time the story became not just the shooting but the police's response to demonstrations and riots, the march was peaceful and well ordered.